It is all too common for integrators to needlessly spend a day or more attempting to integrate a difficult-to-use gateway into an installation. All too often, something went wrong somewhere in the installation process and there are few – if any – tools available to help isolate the problem. To make matters worse, the problem can often be in the controller, the gateway or the end device(s) – or the interfaces between them. That is where the DeviceMaster UP‘s diagnostic web pages come in. 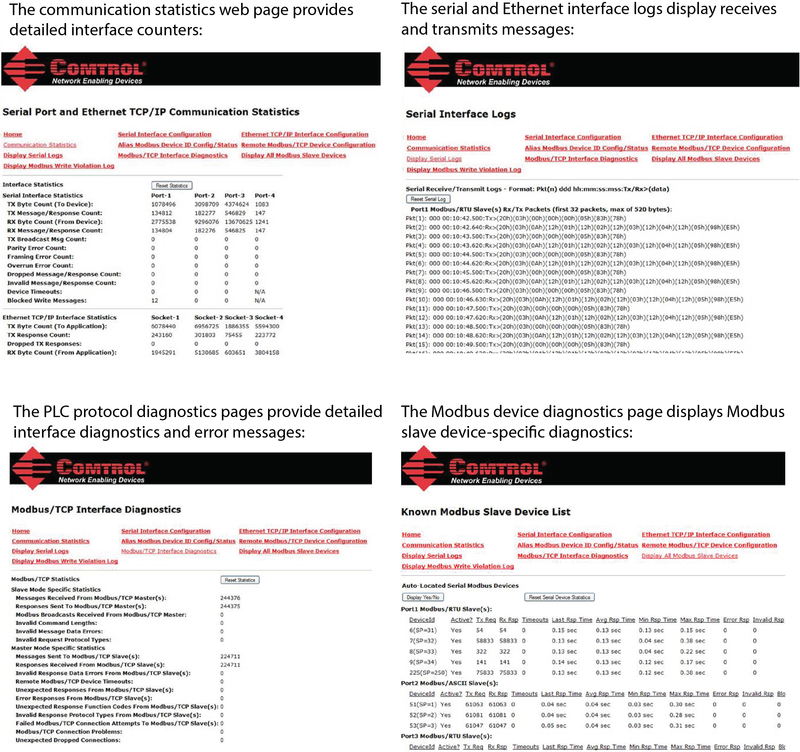 These web pages provide detailed communication statistics, device communication logs, protocol interface statistics and error messages that can help to quickly isolate the problem. The communication statistics, serial and Ethernet logs, PLC interface diagnostics and other features found in the DeviceMaster UP monitor the data being passed through the gateway. Communication statistics feature record counts of errors (parity, framing, overrun, etc. ), dropped and truncated packets, and valid and invalid data items to the PLC. The serial and Ethernet logs automatically display data packets as they move through the serial port or Ethernet socket. The PLC interface diagnostics shows packets sent and received from the PLC, invalid messages, packet errors, and connection problems (if there are any). These are just some of the many additional features the DeviceMaster UP has to offer. Contact a Comtrol representative to learn about all the features for our Modbus, EtherNet/IP, and PROFINET firmware!